I’m one of those people who chops and changes the products I use on a daily basis, well, every day. Recently though, I’ve been limiting the products I use (or at least sticking to them for a bit longer once I’ve passed the initial testing stage!) and my morning routine has become somewhat of a staple. To start, I cleanse my face with Jurlique Soothing Foaming Cleanser. It may be a new(ish) purchase, but I can tell already that it’s gonna be a long term love. I was always wary of products with ‘foaming’ in the title, but this one is gentle on the skin and leaves your complexion looking bright, more even and soothed. It’s a great morning cleanser, as it’s not heavy at all and is very refreshing. Next, as I tend to use my exfoliating toners on a night, I spray on a hydrating toner. My current one of choice is the Trilogy Hydrating Mist Toner, which has a light rose scent and is lovely on the skin. Usually I dislike spraying toners directly onto my face, but this one is so nice to use! Next I mix a few drops of the Pai Rosehip BioRegenerate Oil into my Liz Earle Skin Repair Moisturiser. I love the combination of these two as it makes skin so radiant, without having to wait forever for an oil to sink in. It takes just a minute or two of massaging it in and makes a beautiful base for makeup. 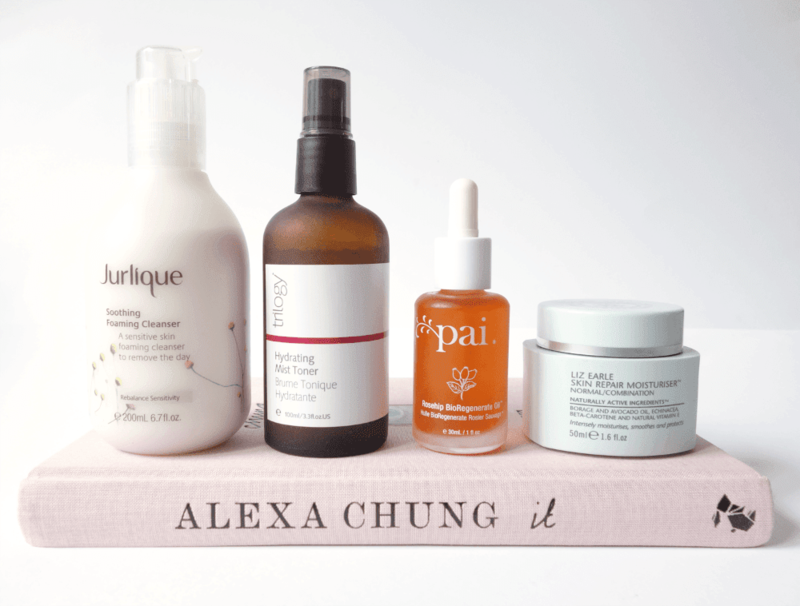 I love using a facial oil every day, so am glad I eventually picked the Pai one up. The Liz Earle moisturiser had been on my wishlist for a while too, and I haven’t stopped using it since the day it arrived. It’s a quick routine that only takes around five minutes, but gives me healthy looking and radiant skin which is exactly what I want. What do you use on a morning?